"There was an explosion at approximately 1 pm today on the street outside the South East corner of the Embassy compound. According to the Embassy’s Regional Security Officer, there was one individual who detonated a bomb. Other than the bomber, no other people were injured and there was no damage to embassy property. The local police responded." The statement confirmed a small homemade device was used to cause the explosion and the suspect identified only as Jiang sustained an injury to his hand. 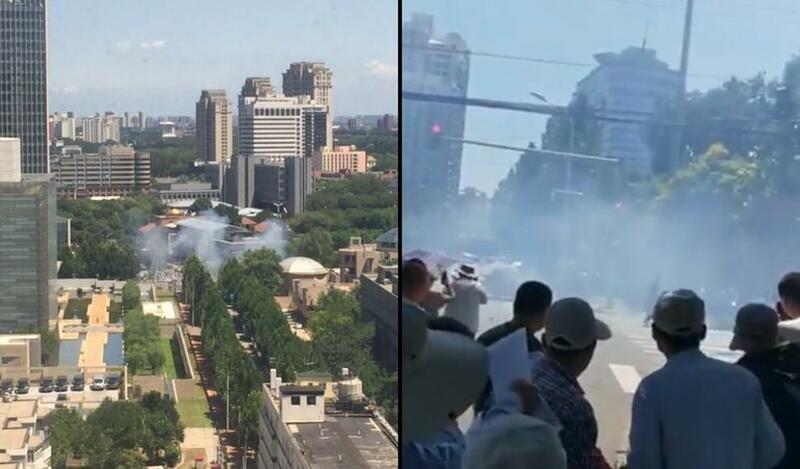 The Chinese newspaper Global Times reported that earlier in the day a woman was taken away by police after spraying herself with gasoline in what appeared to be a self-immolation attempt. By the afternoon, the scene still had a high-security presence. Police have not indicated whether they have obtained a motive for the bombing and said the investigation was continuing. A police SUV was seemingly damaged in the blast with its back windshield being gone completely. The area of the bombing and the damaged police vehicle was cordoned off. Self-immolation has become a regular form of protest in recent years, especially by the Tibetans who protest Chinese rule. China government censors appear to be rapidly deleting social media posts about the bombing. It is not clear if the self-immolation attempt and the bombing were related.